Ratatouille, a French eggplant and vegetable dish, is usually made vegetarian but is often served with meat. Why not make this easy vegetarian and vegan version and serve it with rice or pasta instead? You also could serve it over quinoa or any other of your favorite whole grains. If you haven't already, give kaniwa a try. You'll also notice that this ratatouille recipe doesn't call for any salt, but if you're used to eating salted or saltier foods, you might find that you miss it and want to add it back in. Taste the finished dish first, and then just add a little bit if you find that it's needed since all the other herbs add a great flavor without any salt at all. For best results, always use good-quality sea salt or kosher salt—the extra expense is minimal and the return in flavor is worth it. 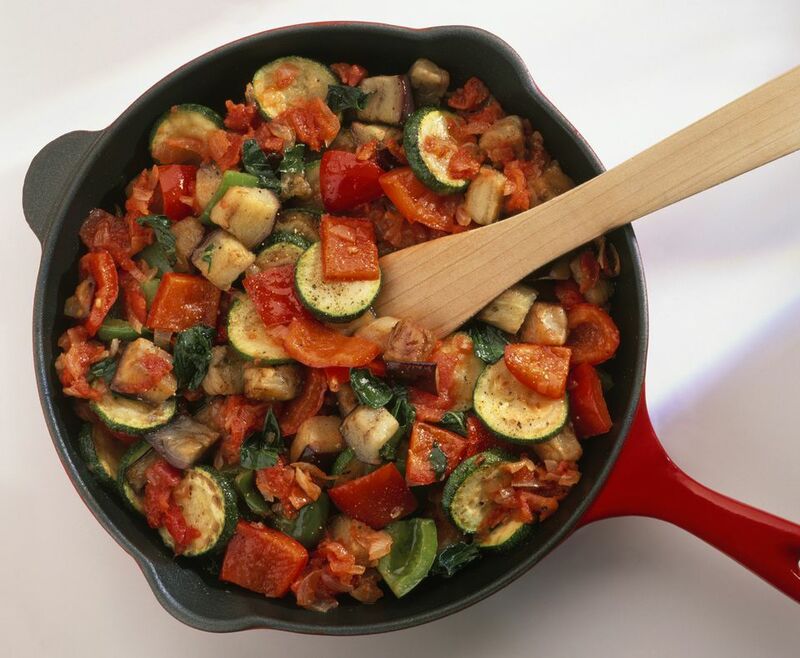 Ratatouille makes for a great vegetarian or vegan dinner entree, no matter how you serve it up. For another serving idea, layer your vegan ratatouille on lightly toasted French bread for a vegetarian ratatouille sandwich. Try it over any of the gluten-free grains for a gluten-free vegan dinner. Heat the olive oil in a large saucepan over medium heat. Saute the onion until translucent, about 5 to 7 minutes. Add the bay leaf, red wine, and tomato juice and stir to combine well. Then add the garlic, basil, marjoram, oregano, rosemary, salt, and pepper and mix until well blended. Cover the saucepan and allow to simmer for 10 minutes over low heat. Add the zucchini and the green and red bell peppers, stir well, cover, and simmer for another 5 minutes. Add the eggplant, tomatoes, and tomato paste and stir again to combine everything together well. Cover the pan and continue to simmer until the vegetables are tender, about 8 more minutes, stirring occasionally. Once the veggies are tender and cooked, remove the pan from the heat immediately to make sure the vegetables don't overcook and become soggy. Serve your vegan ratatouille over rice or pasta with French bread. This vegetarian and vegan ratatouille recipe is reprinted with permission from The Compassionate Cook Cookbook. Like many other traditional cultural dishes, there are as many variations on this dish as there are chefs in France, which means that there's really no right or wrong way to make your vegetable ratatouille. Most ratatouille recipes call for the ingredients to be sautéed stovetop first before being baked in the oven, but this basic and easy vegan version skips the oven baking step in order to keep the preparation as simple as possible for everyday weeknight meals.